I recently travelled to visit a friend in Brussels for a long-weekend. I was very excited as I had heard much about the food, frites, beers and of course the chocolate! I was in unsafe hands- as Shane had been living there for 4 months at that stage- so knew all of the haunts I should visit. Eating out: We spent the weekend grazing around the city, and thus only ate out a few times- two places are worthy of a mention- one is 9 et Voisins. The restaurant was very full upon entering and we were seated at demi-communal bench seating. Service was very friendly and enthusiastic. We both opted for Stoemp, a traditional dish of sausages served with mashed potatoes- infused with a purée of some sort (I opted for spinach). It was delicious. 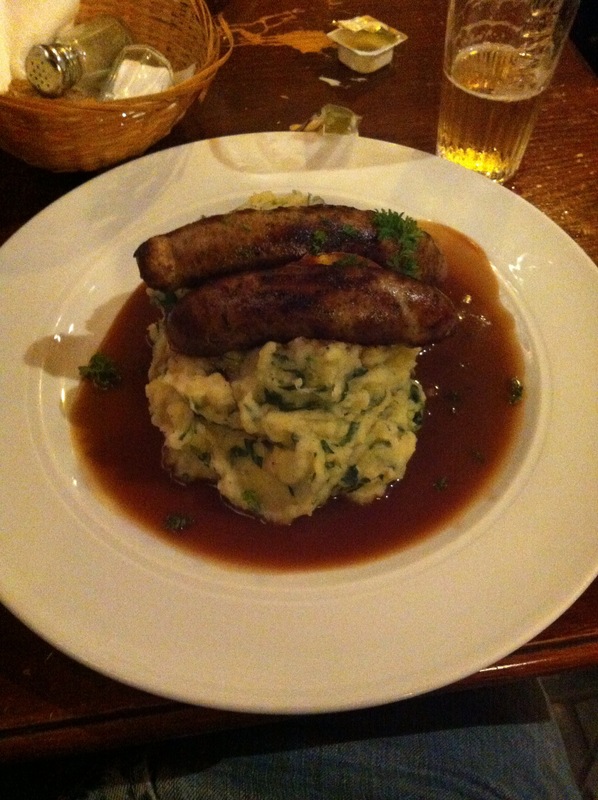 The sausages were chargrilled and the mash was wonderful. Simple food, but delicious! 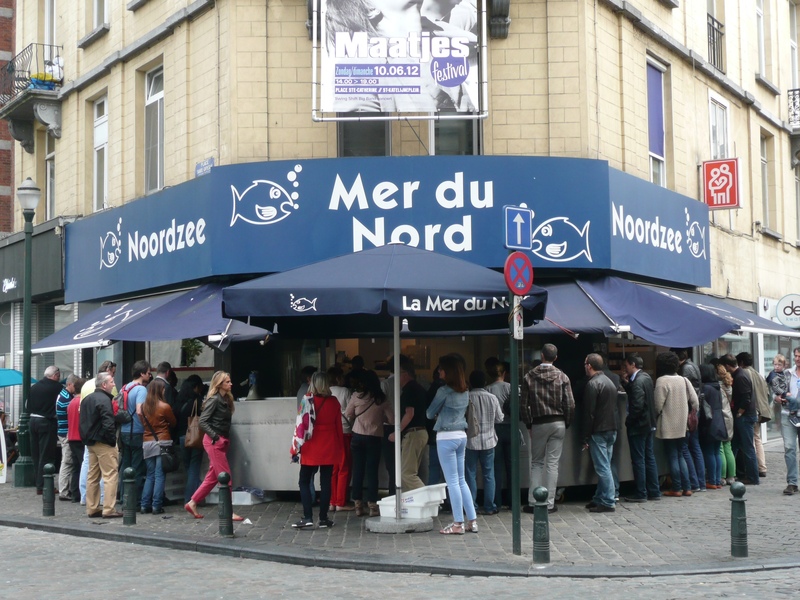 The second place that we both enjoyed was Noordzee Mer du Nord. We ate here on a sunny Sunday afternoon. It serves tapas- style plates of fish. We had one plate of small pieces of fried fish and a plate of brown shrimp croquettes. Topped off with two glasses of white wine- the total bill came to about €16. The ‘restaurant’ is a long metal bar which you can stand at, or they have a few tall tables on the neighbouring square. The service is certainly robust, but good fun. If you don’t collect your order promptly- expect your name to be screamed over a megaphone. Really. Definitely worth a visit if the weather is good. 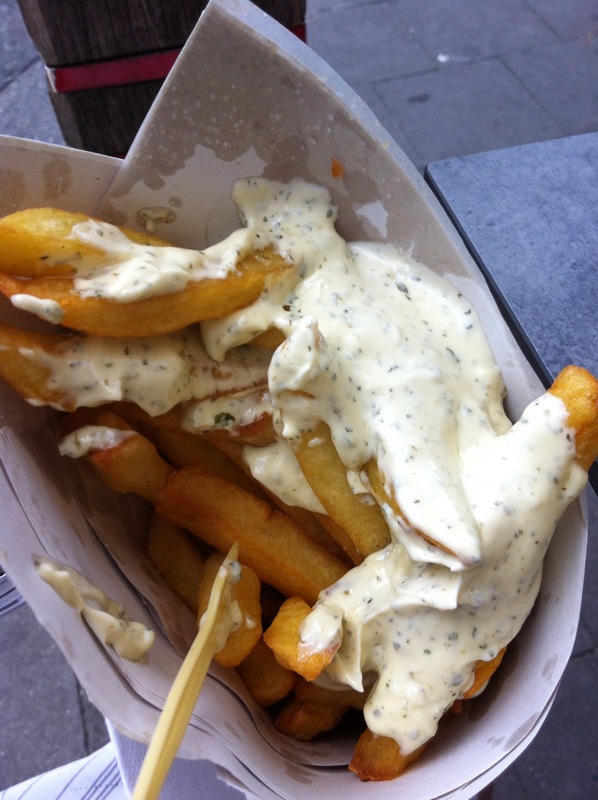 Frites: When I asked you nice people for tips for Brussels- my friend John got quite enthusiastic about the frites. I didn’t realise what a feature of Belgian life they are. 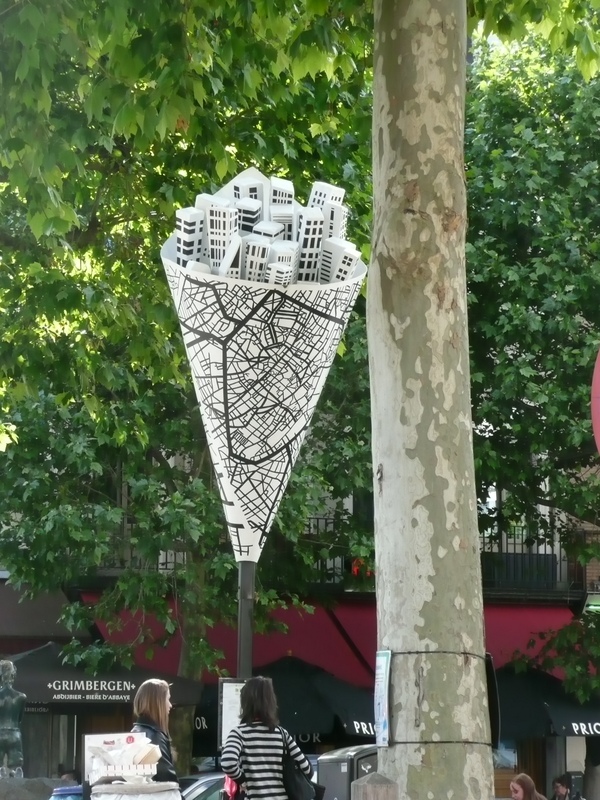 There are even statues of them currently dotted around the city to mark the fact they are celebrating a special year of gastronomy in 2012. Shane is currently busy with the onerous task of compiling a list of the 10 best Friteries in the city. We sampled 2 of his favourites. La friterie de la Barrière de Saint-Gilles is regarded as one of the best in the city and this was certainly the case, however my favourite was Chez Antoine on Place Jourdan. The latter is surrounded by bars- some of which will allow you eat your frites at their tables if you buy a beer. We whiled away a very pleasant half hour there. Potemkine – my favourite- retro with fantastic, old-style fridges behind the bar. Front opens right up and was the perfect place for some people watching. Flamingo– big, little bit like a canteen. Newly gentrified area, thus a very good place for people watching. Moeder Lambic– nice long bar- great selection of beers. Frequented it more than once. BarBeton– nice bar- smallish but good atmosphere. Walvis– little alternative music wise- good bar with a Villo (Their version of Dublin bikes- €1.60 for a day pass- brilliant for getting around the city) station right outside for the journey home. Somewhere that is well worth a visit that also has a percentage volume is the Cantillon Brewery. It is a traditional brewery, brewing only in the winter months (to make use of the low temperatures) but still open for tours during the summer. It is very informal- they give you a brief, but insanely informative talk and let you wander the building at your own pace. Afterwards they will give you some samples of the beer. Admission is €6. Sweet tooth stuff: Belgium is very famous for its chocolate, it goes without saying. Brussels is hanging down with chocolate shops- most of them catering to the tourist trade. There are exceptions to this though. Shane happened to be living very near one of the chocolatey highlights of Brussels, Pierre Marcolini. The chocolates and other sweets in this shop are incredibly beautiful. They are works of art. Wouldn’t a photo be ideal here to illustrate my point? Unfortunately- no photography allowed. I ate one of their almond milk and raspberry ice-cream cones. It was delicious, but be prepared to pay more than you would for a Cornetto. 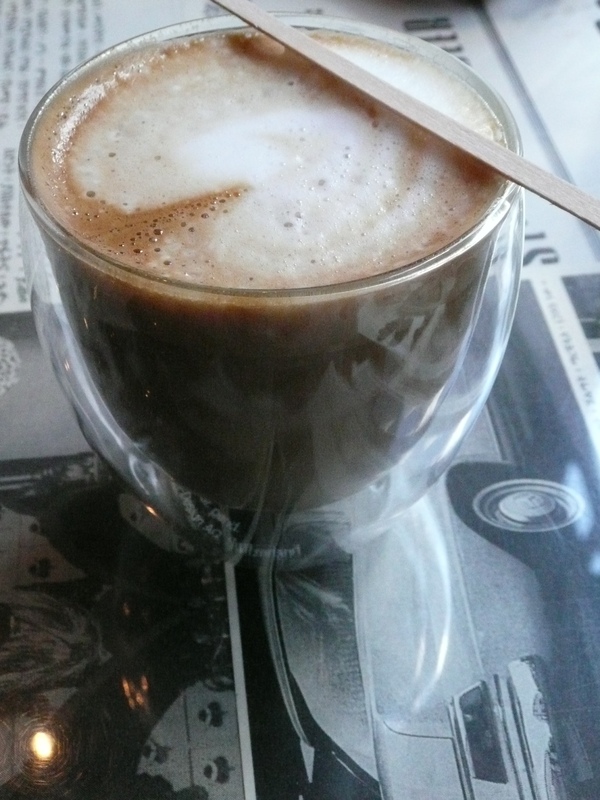 If you are a caffeinated individual- I would have to recommend Aksum, an Ethiopian coffee-shop. It is a friendly and cosy place to recharge the batteries on a quiet street. Free wifi too. Finally- over the course of the weekend- we tried to sample as many different beers as we could- in the tasting sense rather than the binge sense. Aided by the fact most beers are served in 200-300ml measures. We managed 23 different varieties between us- ranging from the lowest supermarket own brand- to the delicious craft brew. 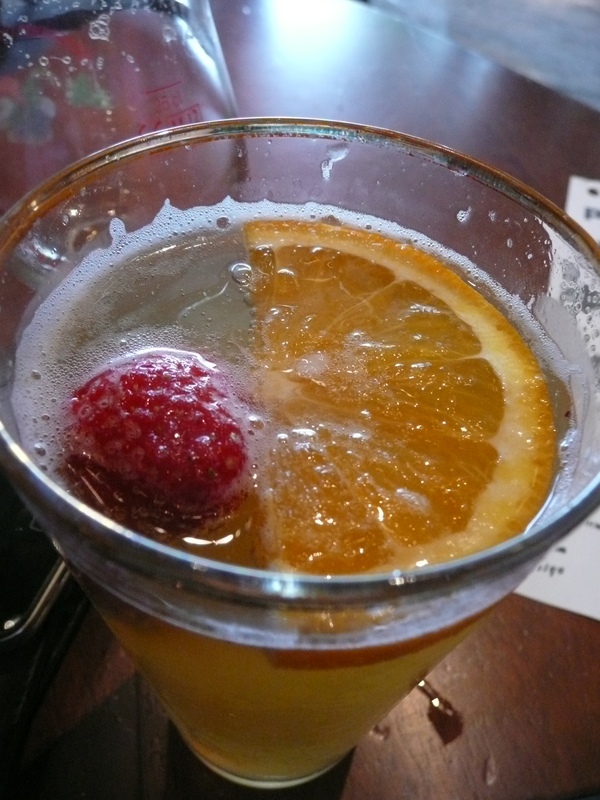 Lindemans framboise – like blended raspberries. Cantillon lambic- the basis for their other brews- sour! Rond blanc sureau- flavoured with elderflower. Served with a strawberry and wedge of orange. My favourite I reckon from the weekend.